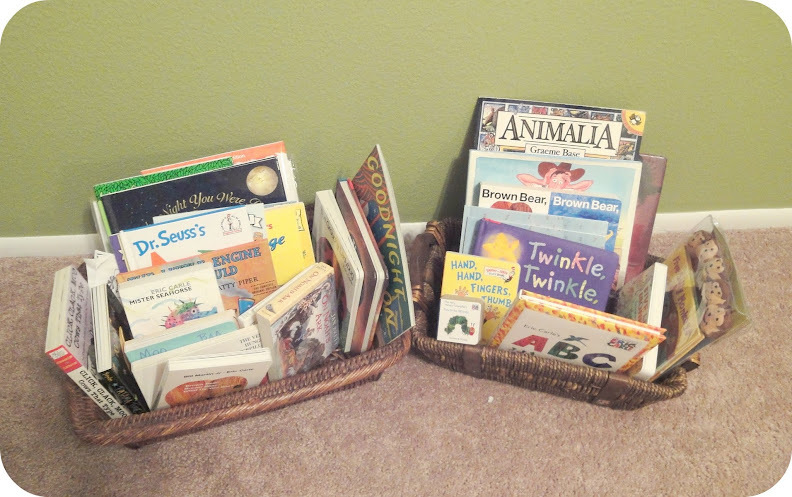 The Sunday Salon – The Nursery Reveal [5.20.12] – my books. my life. The much-awaited nursery pictures are finally here and I am going to jump right into it. 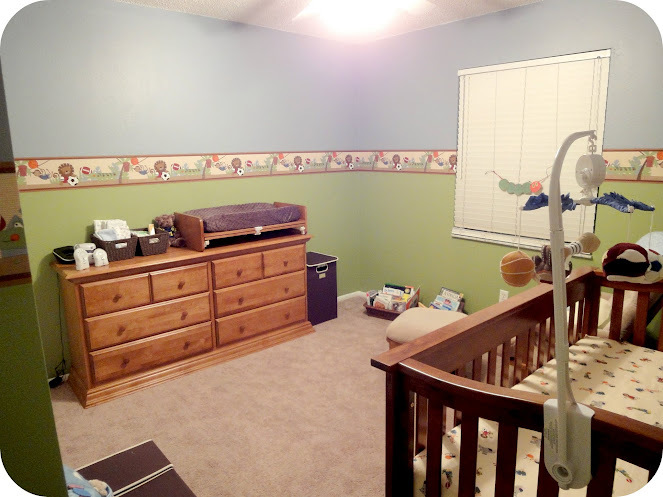 To give you a full appreciation for the transformation, this is what the nursery looked like when we got started. And I am IN LOVE with the result. 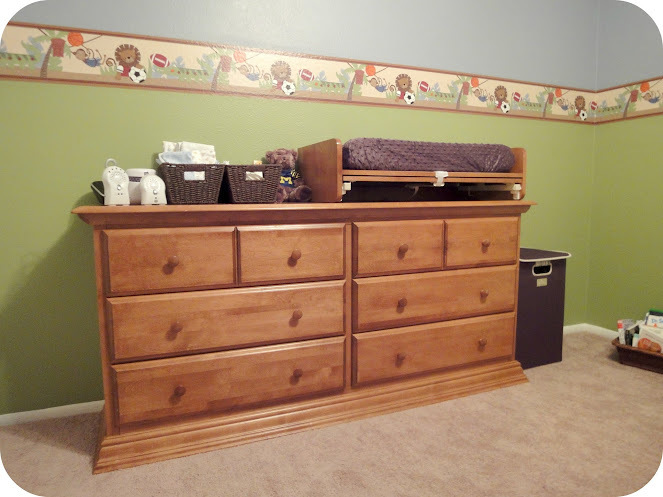 Let’s take a look around, starting with the crib and glider. Ben took out the mirrored doors and installed these closet doors instead. 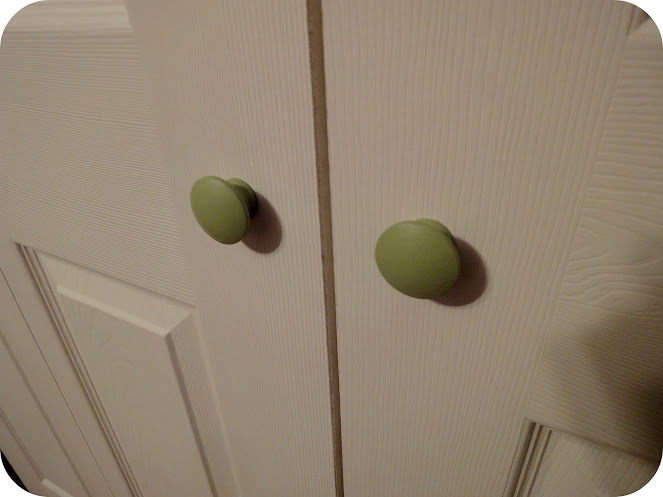 And I painted the door knobs. Here is the inside of the closet, which will never be this organized again. The border is from the Lambs & Ivy Team Safari collection. 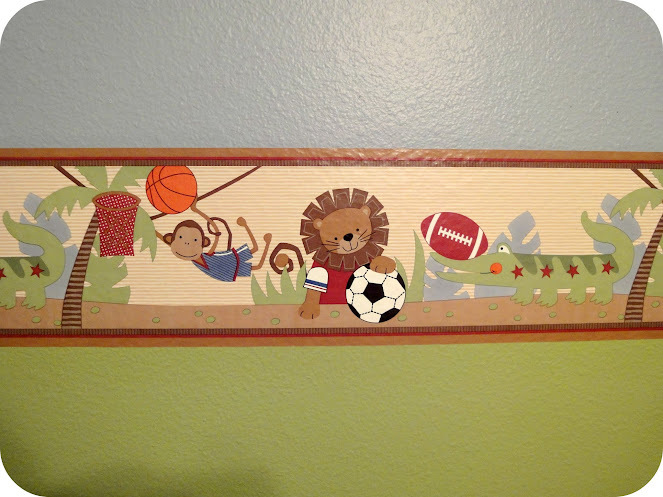 I had to return almost everything else that I bought to go with it because of quality issues (and actually had to have a roll of border replaced as well), but I am still happy we went with this “theme” since I think the border is adorable and animals playing sports is pretty easy to piece together ourselves. A lot of people helped us put this together, really. The crib is a gift from my mom, the glider and dresser are hand-me-downs from my boss, and my friends got me all kinds of helpful items at my shower. The little guy has a lot of people who love him already, including a grandpa who flew all the way from Boston just to paint his nursery. Lucky kid. As I said, I am absolutely thrilled with the way this turned out. I had a vision in my head and I was afraid it wouldn’t come out quite right. Instead, I think it came out better. As soon as I put the last touches on the room, I felt ready to actually have this baby. But until he decides to make his appearance, I might just go sit and stare at his lovely room. It looks really fabulous! Well done! I LOVE IT!!! 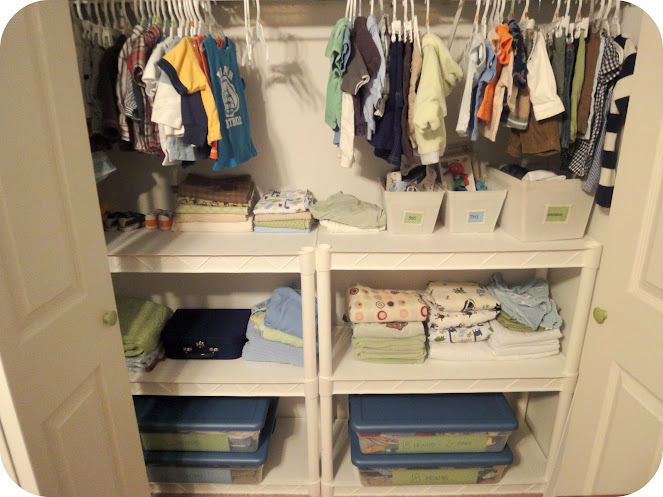 I totally understand too, that you are not ready to have the baby unless the room is ready and waiting and the clothes are ready and waiting. Before my daughter was born, sometimes I’d just go in there and sit and imagine. Everyone involved did a wonderful job. It is precious that your dad came down to paint. Ooooh it look so good!!! I love the theme! I love it! You guys are so creative! 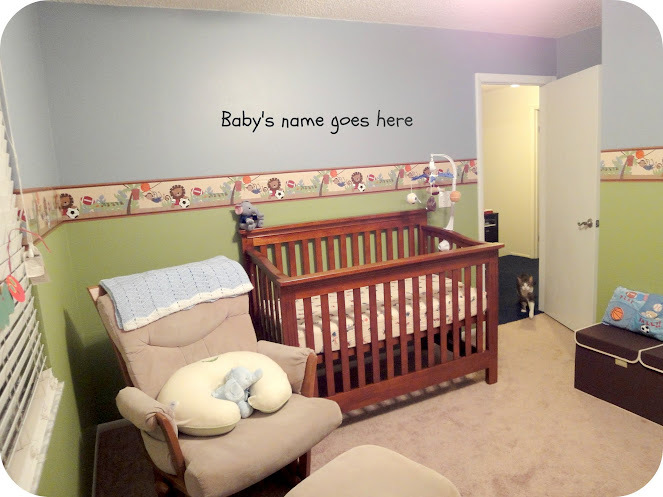 Wonderful nursery! 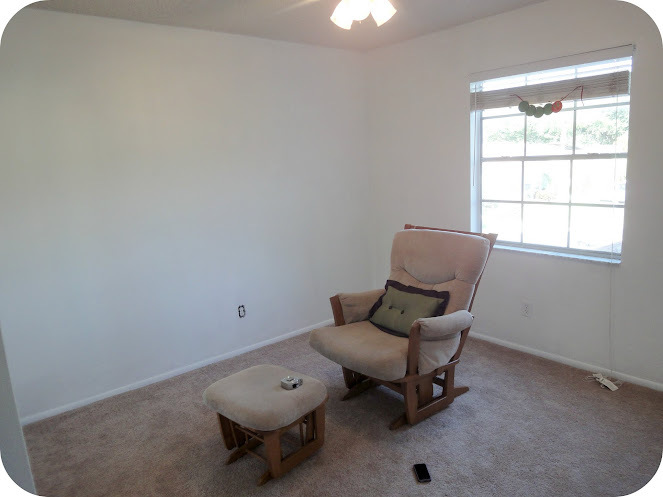 the colors are great as are the furniture, decorations, and books! You must be so ready for him (right?) to arrive! It looks so good! You guys did an amazing job. I went with a green/yellow room when they told me I was having a girl because I just didn’t believe it. I had already had my son and my husband’s brothers had nothing but boys so when the doctor told me that I was carrying a girl, I went totally neutral just in case it went the other way. And then I had this girly girl who was forced to be in a neutral room! As soon as I could, I switched it out! LOL. Your room looks perfect. The color scheme brought back memories for me. So adorable. You guys did a great job! It’s looks great!! I love the shelves you put in the closet. Great idea! I am having a baby boy in 2 weeks! When are you due? 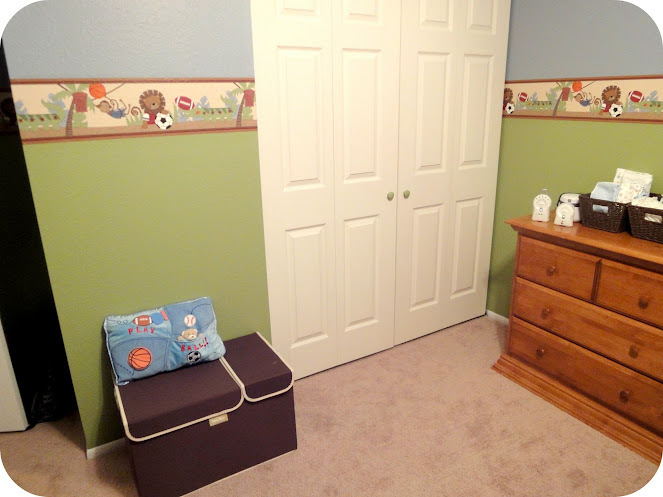 Our nursery is almost done too – and there are WAY too many books in there. Congratulations to you – when are you due? Not sure how I missed these photos. But WOWOWOWOWOWOWOW it’s fabulous.